The Relief Wrap™ Brace helps patients place electrodes on difficult to reach locations without assistance from others. The ReliefWrap™ Brace helps patients place electrodes on difficult to reach locations without assistance from others. This belt can be customized to fit patient’s specific needs based on treatment protocols. Available in a wide variety of sizes (see below). High quality, double pull, back belt for compression. Find your natural waist. An easy way to do this is to stand in front of a mirror and bend at your side. The crease that forms indicates your natural waistline, directly above the belly button and below the rib cage. Stand up straight and relax your abdominal muscles. Wrap the measuring tape completely around your waist starting at the belly button. Begin at the spot on the tape where the measure reads ' 0 '. Make sure the tape is level around your waistline- not too loose, not too tight. 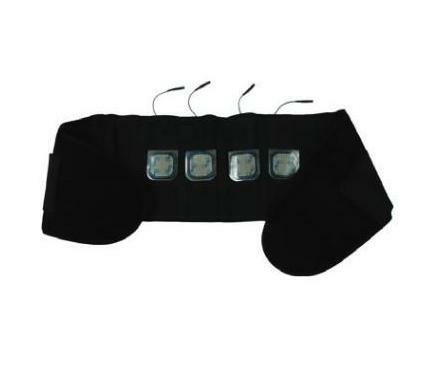 Click on Related Products to purchase Hold/Cold Packs and/or extra electrodes. Hot or Cold Gel Pack - 7.5" x 11"
Hot or Cold Gel Pack - 11" x 14"